...... Marsh gas both in the Arctic and in the Antarctic was leaking continuously, and the temperature was increasing around in the middle latitude, however it was extremely cold in the high latitude of South and North Pole. I was not able to tell which the country is. As I saw the continent, my view was turned to the sinkholes. This happened twice and it lasted 5 to 10 minutes for each time. 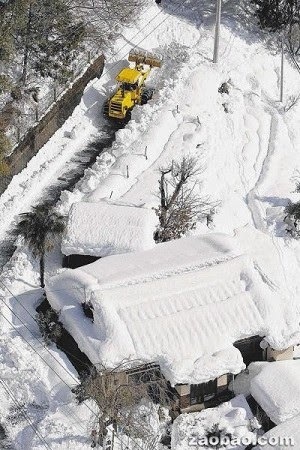 At least 11 people have killed by a record-breaking snowstorm in Japan, according to local media. Hundreds of people have been evacuated from their homes and hundreds more injured, as more than one metre (three feet) of snow fell in some areas. The snow forced airports to cancel flights and closed roads as it barrelled past Tokyo on Saturday. Forecasters are warning of blizzards and avalanches later, as the storm moves north towards Hokkaido. Kyodo news agency reported deaths in several prefectures near Tokyo, and other deaths as far south as Oita on Kyushu island. Reports said roofs of buildings had collapsed under the weight of snow in some areas, and hundreds of drivers had been left stranded in miles-long traffic jams. Some 27cm of snow was dumped on Tokyo on Friday and Saturday, and several other cities reported record snowfall. The Northeast's second winter storm of the week dumped more than a foot of snow in some states — forcing schools, businesses and government offices to close; snarling air travel; and sending cars and trucks sliding on icy roads and highways, an all-too-familiar litany of misery in a winter when storms seem to be tripping over each other. In all, more than a million Northeastern homes and businesses lost electricity, according to local power companies. At its height, the storm knocked out power to nearly 849,000 customers in Pennsylvania, most of them in counties around Philadelphia. A crippling and deadly winter storm that battered the South with a combination of sleet, snow and ice a day earlier, causing more than 700,000 power outages, moved up the East Coast overnight into Thursday and blanketed cities across the Northeast. A state of emergency was declared in several states, including New Jersey and New York. At least 21 deaths across the country have been blamed on the weather, which affected 22 states from Texas to Maine. The RSPCA estimated that 100,000 could have died from heat exhaustion in record temperatures in southern Queensland. Brazil is sizzling, and with the heat index sometimes soaring above 120 F, keepers at the Rio de Janeiro zoo are giving the animals ice pops to beat the heat.